Weather!!!!!!!!!!!!!!!!!!! !To me it makes more sense to go to a warm weather school to play softball and baseball. Your outside playing and practicing year round. I am just too much of a homer to not want all of the local talent to stay home and represent their state by playing at the U. Watching OSU and NC. Why didn't OSU pitch like this last week. Pretty uncharacteristic defensive effort from Oregon State today too very poor. 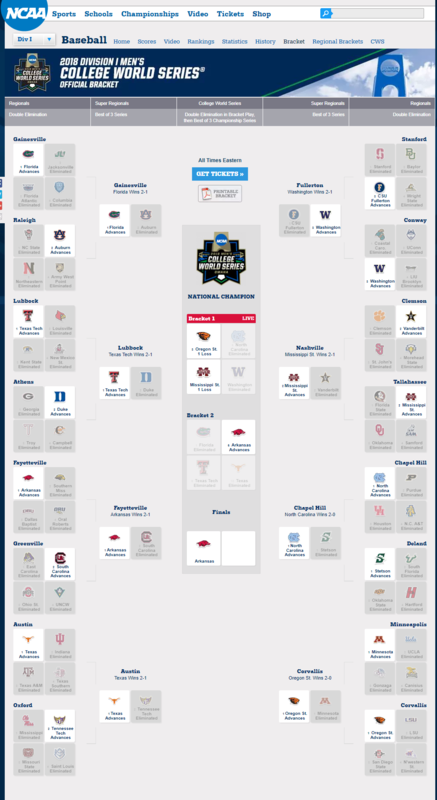 It's too bad that we didn't end up in the top right section of the bracket. Win any one of those regionals and we would have had hosted a super regional......with a good chance to make it to the College World Series. Unfortunately we ended up facing a CWS finalist.....and potential national champion. Oregon State beats Arkansas 4-0 in game 3 to win the National Championship Can take a little bit of happiness that the Gophers played them as well as pretty much anybody has and did it on their home field. At the same time definitely feel upset that the NCAA didn't do a very good job on seeding the Gophers and think about just how far this years team could've gone. Definitely think the season would've ended in Omaha instead of Corvallis if the Gophers got that 10/11/12 seed they deserved. My Beaver friends were super impressed with the Gophers and thought that they were Omaha worthy. I was sick when I saw the pairings. The SEC gets over seeded every year and it gets to be a self fulfilling prophecy when you put in eleven teams in the NCAA’s. A few are guaranteed to get to Omaha. There is good to great baseball other places than in the SEC. I can tell you that our two frosh pitchers sure wowed the crowd in Corvallis and a big question was how they missed on recruiting Fredrickson. They appreciate good fundamental baseball and the Goph’s showed that in spades as opposed to LSU the previous weekend. The Rodent matchup should have been in Omaha. The game last night was representative of the Beavers’ play the last two years. I got to watch some superb baseball. They played uncharacteristicly sloppy ball for a lot of the CWS and still walked off with the trophy. The weak link in the pitching staff coming into the tournament wins four games! Baseball can be crazy. Hoping for another regional at Seibert next year. This was one fun baseball season for me. D1Baseball.com put out their final poll today and the Gophers were #9. The 8 teams ahead of them were the ones who made it to the CWS. Gophers were 8th in the final perfect game poll. Ninth in the country is damn impressive for a Northern school. I hope Coach A and the boys are proud of their season and the level to which they’ve taken the Gopher program. More 1st team All American honors for Fredrickson and Meyer. Is there a list somewhere of where all the players are playing this summer? I saw the update last week that included 10 or so players. What about the rest? Or do some players not play at all during the summer? Some guys take time off, some guys have surgeries or are rehabbing injuries, and some are doing internships. I believe 16 guys are playing right now this summer while 9 are not and at least a couple of them are rehabbing injuries.